My buddy Jason Sowell leads a super cool non-profit organization called Current. 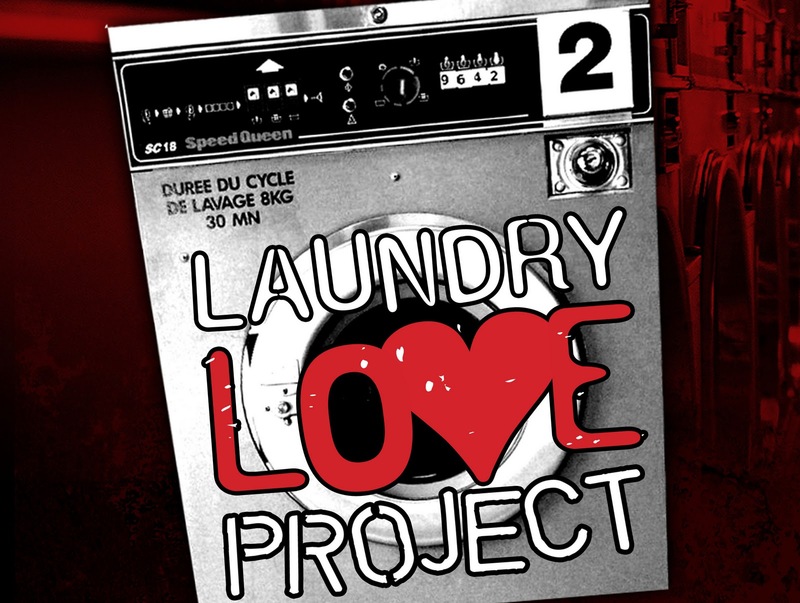 Part of what he does is something called the Laundry Love Project. Now he has been doing these for years and has even taken it so far as to come to Vegas for the last three years and wash people's laundry for them. Now I have to be honest that when he first told me about it I was a bit skeptical. I really thought: "You are going to do laundry for people?" It didn't register to me. He finally got me to come and check it out (and help) for the last laundry project that he led in Vegas and I was in awe at what he does. I think that Jason is meeting a social need for people. It never hit me that there are people in the world, in my own city, that cannot afford to wash their clothes. I have taken that fact for granted for the last 32 years of my life. It was great to see the expressions on the face of the people when we told them that we would pay to do their laundry. Now it wasn't free. Jason raised a bunch of money to make it happen. Jason took time to find money to bring it Vegas so that he could pay to do someone's laundry who he has never met. Think about that real quick. I saw it with my own eyes. I was able to grab a fist full of quarters, put them in my pocket and sock them away in laundry machines so people could have clean clothes. Jason plans on returning to Vegas in May and I told him that I would get a team of 15 people together to go down to the Laundry Mat and help out. We only had six people while I was there and that wasn't enough people to help out. We need your help to help out others for something it is needed! Before you write it off, just watch some of the videos listed on his site. About five months ago I went to my dermatologist to get a final check up on my skin. As she examined my skin I really thought I was out of the woods with her. See in the last five years she has removed two moles that precancerous from my back. At this appointment I thought I was done until she asked me to turn around and look at the back of my legs. She pulled out her pen and circled a spot on my leg... I was bummed. That day she cut the mole off and I was out. I got a call back and just assumed that the mole was fine just like the rest but this time I was wrong. 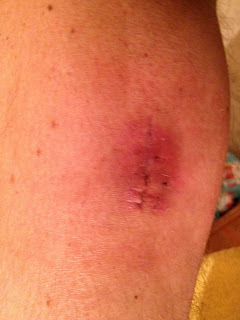 I was called again to get an appointment to get in as soon as I could so she could cut the mole off a little deeper because she didn't get the entire precancerous matter out. I went in early on a Wednesday morning and got prepped to get the mole removed. It was extremely weird being awake as she was cutting my leg open. She informed me that she would need to cut out the mole and then cut my leg in a diamond shape so that she could stitch it up properly for healing. 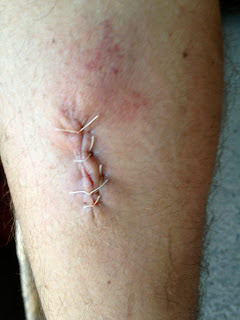 This is a picture of my leg after 24 hours of it being removed. I saw my leg after the first day and I was pretty nervous that it would be jacked up but I knew that I would rather have a nasty scar on my leg then no leg. Well it has been almost three weeks now since the surgery and my leg is looking much better. I am thankful to share that my doctor is amazing and was able to remove everything that precancerous. I have a great doctor who did a great job on my leg and it is looking so much better! About two weeks I received and email from an amazing lady named Suzanne. Suzanne has a really cool story that prompted her to start her company called In 12 Days. The connection happened because of the guys on our staff wanted to propose to his girlfriend. In 12 Days wanted to help him out by blessing him with an amazing way to propose and hook up a free engagement ring from a local jeweler that was announced on the local Christian Radio Station. The more and more I think about what Suzanne does and the impact she is having on Las Vegas I just help but think what a special lady she is. I think about the time that she has taken to help bless these families in our community. I think about the time she has taken to think about creative ways to bless people. I think about the hours she has invested in getting people to help her out to bless others. I start thinking that this lady is really fulfilling her purpose in life by being a blessing to others. Then I finally think: "What if everyone acted the way she does?" This morning I received an email from Africa talking about a country that broke my heart five years ago. Five years ago I was able to go to Burkina Faso, in West Africa, with a team of twelve people. I was fortunate enough to go with my wife on this trip which made the mission trip so much more beneficial for me (The picture of us on the alligator is the best one I have of just us and I can't find one of the team). I don't want this blog post today to turn into a discussion about alligator riding but to focus on the need of Burkina now. See ever since we went to Burkina our heart has broken for the country. I actually tried to lead another trip there about a year later with some students but it didn't pan out (it was a good thing we didn't go). Our church has since sent two more teams to Burkina and every time they leave I wish I was going with them. The children in Burkina broke my heart. They were so much fun to play with, hang out with, laugh with and joke with. I would love to bring my little girls over there (soon) to experience the country and the people. See the main reason I wanted to blog about Burkina today is due to the email that I received this morning talking about clean water. I am not a fan of watching videos longer than 2-3 minutes but this six minute video is well worth the time. Watch the video here and start to think about what you could do to help people who do not have clean water! On Saturday Charity and I went to see the new Sherlock Holmes movie; A Game of Shadows. We both totally loved the first one so when the second one came out there was no question if we would see it or not. Now I am not a movie review kind of person but I did want to share some thoughts about the movie with you. I am not going to give anything away about the plot of the movie so don't worry about protecting your eyes as you read this. First of all I love the movie! I love the action in the movie. It is a movie that keeps you thinking. 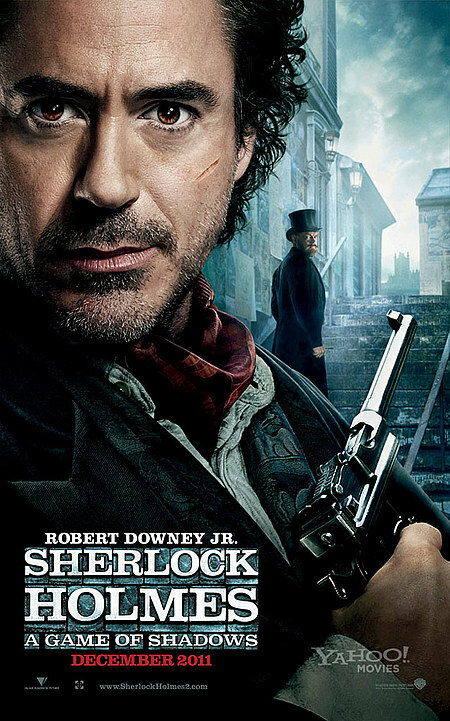 If you saw the first Sherlock Holmes then you know what I am talking about. Every little detail in the movie seems to come back and play into the whole of the movie later on. I love how creative the writers of the movie are (I am not sure who they are but the did good on this one). The attention to detail in these movies has always impressed me as someone who likes to think about what is going to happen next. Now I have to admit there are some behaviors in the movie that I would consider questionable. Doctor Watson is portrayed as a drunk who can barely stand on the way to his wedding and he also has a pretty intense gambling problem. There is one point where Sherlock Holmes disguises himself as a female to help save his friend. I didn't sense there was a drag theme at all but that Sherlock was considering the best way to help his friend out. Finally the best part about the movie was that I was able to see it with my wife on our date day. We love to create a time, each week, where we just spend time with each other. The movie is not the ideal place for this but this time we had to make it happen. See Charity and I have committed to never stop dating each other and times like this allow me to hold my wife's hand, eat popcorn with her, laugh with her and talk about the movie afterward. About four months ago I received a transition in our church. 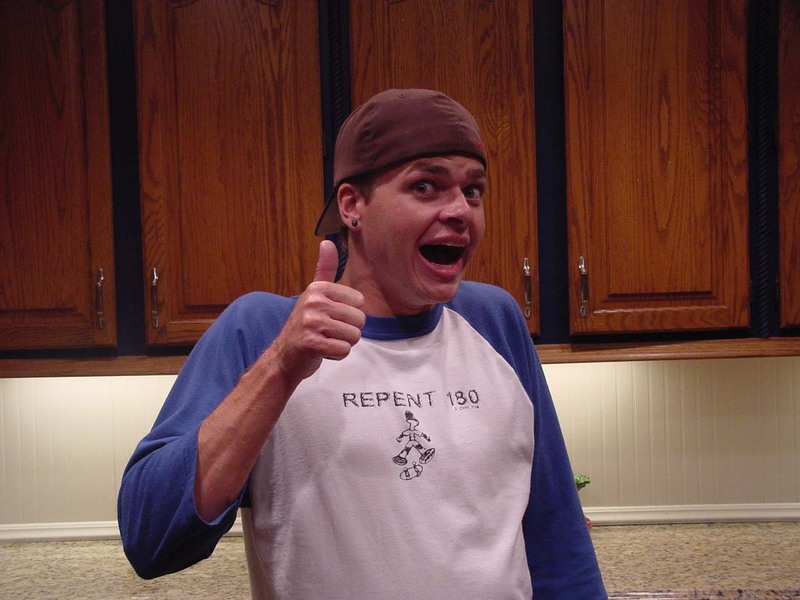 I had served in our student ministry department for almost seven years and was asked to transition over to adult ministries. My new role is completely different than my old role. My new role is more daily organization, my phone calls and more different than I ever expected. When change happens in our life we tend to examine things around us. I began to examine my leadership in student ministry and really started thinking about how I would change if I had a change to do it again. I also started to think about what I would do more of and take more time and energy to invest in. One thing that keeps sticking out to me is that: "More is Caught then Taught" in ministry. I say this because I constantly hear young adults in our church, that graduated from our high school ministry, say things like: "Neal I remember when you said this to me or took the time to talk to me about this." Last night I was talking with one of these young men and he told me about a conversation that we had and how I was encouraging him in relationships. Yesterday afternoon I spent some time with one of the guys who was in my small group and now is a junior in high school. We have kids, students and people in our church that are watching what I do. You have kids, students and adults in your church that are watching how you act. I believe that more is caught in ministry than taught. I believe that people forget most of the messages that we speak from stage but remember what they see us doing in our community, office, trucks, backyard and soccer field. People are watching what we do and that is why this verse is so important as we live our lives. I think that people are going to remember the time we invest into their lives more than our actions on a stage, or leadership position, the degrees on my wall and the things the world thinks are important. For the last thirteen weeks I have been taking a class with about 250+ other people in our church called Financial Peace University. After taking the class I wanted to share some thoughts that really stuck out to me about the class, the material and what I learned. I think something very important to note about this class is that people in our church paid off almost 2 million dollars during the thirteen weeks of this course! This class has provoked conversation in our church that probably would have never occurred without the class. I wish I had counted how many couples told me this has improved their personal conversation. There were people in our church that just never spoke about money and this class has helped people to talk about a topic that was such a taboo. Its funny to hear about how a class that is so focused on money has helped save marriages in our church just by opening up conversation. Before I took this class I really could have cared less about credit cards. I thought they were actually really cool. I could buy stuff that I wanted today and then pay for it later down the road. Then I got this credit card that actually gave me free air flights for just spending money on it. We were getting about four free flights a year with this card and that was pretty cool. We would use this credit card like a debit card and then pay it off at the end of the month... so I thought. When Charity and I really started examining our spending on this card we realized that we owed it about $1500. We made a goal to pay that off and cut the card up. Cash is pretty fun but when I spend it I get bummed sometimes. See I learned, when we moved from credit to cash, that it actually makes me think more about the purchase when I use cash to buy it. We have moved to a strictly cash based system in our family because of this course. It may be a little more difficult then using a card but we know where our money is going and we are no longer in debt. Though this course I have seen people get connected to our church. I have spoken with families who are meeting people and doing life with them now on a weekly basis. People in our church are getting connected to others in our church through this class. We had people sit at tables and have discussion about the weekly lesson. It has been fun seeing people get connected through this course. 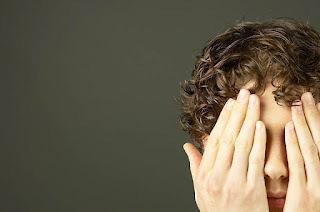 The world we live in desensitizes us to the things around us that normally would bother us. I remember when I first moved to Vegas and how awful I thought the billboards where. I could not stand seeing the advertisements that were on the back of the taxi cabs here in town. Now, seven years late, I realize how desensitized I am to that. See over time we become desensitized to the things that once bothered us. This can happen in your work place, your home life, your school, and in your Christianity. I am sure there are things around you that once made your stomach turn (even if it was just a little). There were once things in your life that you could not stand to watch but now when you see them you ignore it because you have seen it so much. Think about some of the things that middle school and high school students are seeing on a daily basis; things that would have never been accessible to me when I was younger. Think about the things that are shown in movies now days. Things that would have never been allowed on the "big screen" are now a regular occurrence. The saddest thing is that I just sit there and do nothing about it. Sometimes I laugh, sometimes I turn away but for the most part I do nothing. 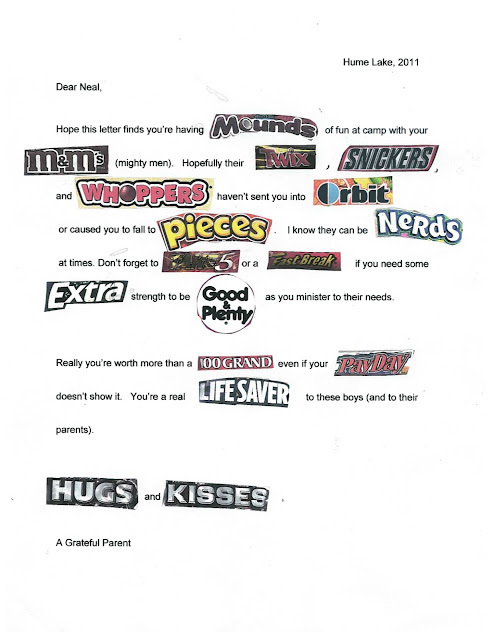 I am more and more perplexed, bothered, and frustrated by this as a dad then I have ever been before. The issue I struggle with is how to appropriately engage culture to see life change... I want to be a part of life change in the world and I really think the more we desensitize the world the more clear we need to present the Gospel of Jesus Christ to those who are looking for purity in a world full of sludge. I am currently take a course for Tozer Seminary called: "Politics, Legalities and Money". The class has really been super helpful and has impressed me as to the content we have studied for the course. I just emailed my final paper to a great friend who will edit it, make it bleed, and then help me correct my grammar. For this course I sought more external resources than I ever have for a final paper because of the nature of the class. Thanks to a classmate I was able to get a handful of helpful books from the Simpson University Library. 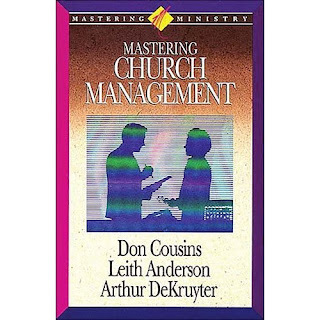 One of them is Mastering Church Management. Now I am sure that most of you will not run off to Amazon to get the book but I think you may want to reconsider that. This book has a some great information contained within the interesting looking cover and was considerably more helpful then I had imagined it would be! The book was helpful with information on maintaining staff moral, encouraging staff members, staff transition and lots of other areas of staff leadership. I was thinking to myself today about how cool it is that the principles laid out in this book are still applicable some 25+ years later. If you are thinking about becoming an executive pastor, lead pastor or church planter I am going to recommend this book to you. This has been running around in my mind A LOT lately. I think it all started when I really was evaluating what the city I live in really stands for. Most cities have a name they are known for. Before I moved to Las Vegas I lived in America's Finest City (San Diego). There is the Motor City (Detroit) and we also have the Windy City (Chicago). I am sure there are very creative names for many other cities across this globe but for some reason or another God has chosen to place me in Sin City. When I look at these different city names they all seem to fit. I was blessed to live in San Diego for just over five years and that place is truly America's Finest City. It seems logical to me that Detroit would be called the Motor City understanding how the auto manufacture's cars there. I have never been to Chicago before but I have heard that it is very windy. I have lived in Vegas for over seven years now and it really is Sin City. After thinking about these city names I got to thinking about what I stand for. If someone had to give me a name for what my life was all about what would that name be? If someone gave you a name for what your life stands for what would that name be? Names are given to places because of what they have chosen to focus on and be known for. In a world that has chosen to reject God on so many levels what are you willing to stand for and what will you be known for? Last week we pulled out of Vegas for our annual trip to the in-laws house. Basically ever since I met Charity we have gone to do Thanksgiving with her family and this year we did the same. There were a few variations to the trip and one big one was that we stopped to see my dad on the way to Santa Maria. We had a great time with my dad and while we were there we took some time to visit the property where my dads house that I basically grew up in. In Oct 2007 my dads house was burned down in a fire so it is weird going there and not seeing his home but my girls loved running around the 10 acres of land that he has! After that we jumped in the car and heading to Charity's parents house. During the week we did some really cool things like head to Pismo beach where we played on the beach! After taking a good walk on the beach we went over to Splash Cafe and had THE BEST clam chowder in the world! If you go there you need to make sure you order it with the seafood topping on top; you will not regret the choice if you like seafood. While we were there Sophie and I took up our favorite weekly tradition of going out to get doughnuts. 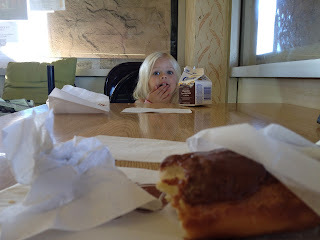 I really love these times of eating doughnuts with Sophie, talking with her and just hanging out. I know there will be a day that she doesn't wake up at 6am and had no desire to get breakfast with me but on Saturday that was not the case. Sophie and I went to a cool little doughnut shop that basically had a bunch of old men sitting around drinking coffee and me and her there. We laughed, ate doughnuts, had chocolate milk and then brought doughnuts holes home. The entire week was a great break to spend some time with my family, see our extended family and get to laugh with family. Overall I am just so thankful for the family we have, how God has blessed us and how much we get to do! Every year, around this time, I end up having the cool opportunity to write some references for people who are wrestling with their faith. Right now we have high school students that are trying to figure out the rest of their life right now (that is scary, read it again) and I have a cool chance to help be a spiritual guide in that process. Generally I am not the person that likes to sit down and work on paper work but I feel like it is an honor to be able to write these references for students and share what God is doing in their life. I get to be a cool help to someone on the other end that is trying to help this student figure out their life path. It goes deeper than that because this las week I was able to write a third reference for one of my first small group guys as he is getting ready to graduate with his bachelors. I love to look and see what God is doing in his life. He is such a great young man that I couldn't imagine not being a part of all that is happening in his life. Finally, I have another guy in my life who I just was able to write a reference for him to attend seminary! I am so proud of all that God is doing in his life. I was able to lead in Middle School ministry here with him at South Hills Church. Then I was able to be a part of him and his wife falling in love. After that I was able to preform his wedding ceremony (which was so cool). Now I get to see, first hand, the plans that God has for his life coming to bloom. Basically what I am saying is that there is something cool about being involved in people's lives for a long period! I have grown up having a dog in my home ever since I can really remember. When Charity and I first got married we waited about a year and got our first dog Rosie. Rosie was a good little dog but once Sophie became mobile we realized that is wasn't going to work out to keep Rosie around and made the tough choice to give her away. For the last year I have really wanted to get another dog in our home but it just hasn't been the right timing. I have looked at many different breeds of dogs and have narrowed my list down to certain breeds I like better than others. Then once we started taking Financial Peace University (FPU) I realized this was a cool chance to get my daughters in the habit of saving for what we want. See Sophie and Leah both love dogs and I'm sure they can't wait until we get one in our home but FPU taught me that I can't just use my credit card to buy a dog and think that everything will be ok. Starting about ten weeks ago Sophie, Leah and I began to save my extra allowance money in a mason jar in our house. It started out with a few bucks here and there and then I started having to swap out the ones in there for fives and tens. Right now we have $24 saved up to buy our dog. The goal is to have enough money to be able to head to the pound (or Craigslist) and find a dog that really needs a good home. We have decided that there are enough dogs in the world that need a good home and I think we can provide that home but not until we have enough saved up. Some of the cool parts of this saving is it provides an opportunity for me to teach my girls the value of saving and allows them to see the growth as we pack dollars into the jar. Something even better is the other night we saw our friend and shared with her what we are doing. After Sophie told her our plan she reached into her pocket and pulled out a dollar for Sophie to stuff in the jar. I'm very excited for the day we get to head to the pound and rescue a dog! 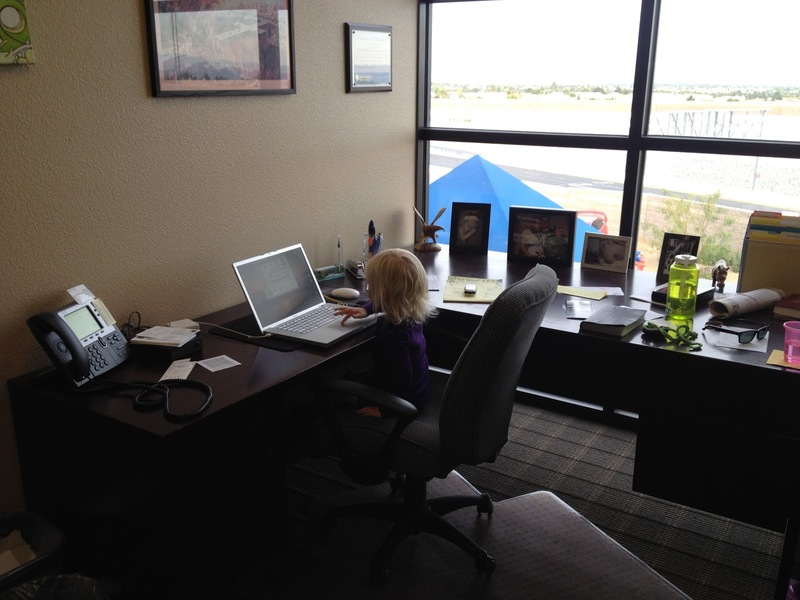 For the last couple months (maybe weeks) Sophie has been asking if she could come to work with me. 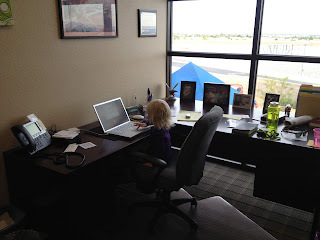 Now I would love to bring my three year old to work with me but lets be honest: she would be bored! Well this Sunday was the time change and that is a joke if you have kids but I decided this would be the day to bring Sophie with me. We got all ready, we held hands on the way to the truck, Sophie sang about how excited she was to come help me out and we headed over to church. Since it was the time change we showed up a bit early and got our FPU class ready. When I needed to print some things Sophie decided that she would help me out and got on the computer. Honestly I was a bit nervous bringing her t the office with me but she did great! I brought her into our staff prayer time before service and I told her that we can't talk. While we were talking through the service she looked at me and said: "How come they are talking?" Sophie is very into being fair. It was a great day with Sophie and I just knew that I needed to share this moment. This week we had to drop Charity's car off at the mechanic so that meant we were using the truck for the day. I pulled the truck in the garage; something that has never happened before and the girls loved it! We took some time to play in the truck while I was putting in another car seat. Sophie was having fun playing around in the truck (turning all the knobs to something different and eating my altoids). Then I brought Leah into the truck and they were being so cute with each other. I let them play together for a little while and then Sophie asked me to turn the truck on and roll up the windows. I was not about to roll up the windows and leave them in there but I did want to film them and show the world how cute it is when my kids sings to Justin Beiber! We did our traditional halloween and went over to our friends the Yurek's home for a little party. Charity dressed up as a Chargers fan and in the pic to the left I don't have my costume on yet. Sophie was dressed up as Tiana, from Princes and The Frog, which also doubled as Justin Beaver's (that what Sophie calls him) girlfriend. Little Leah dressed up as Tinkerbell and was the cutest fairy ever! Last night I had so much fun with my family! We started off by watching the Chargers game and then took our party to the streets to get some candy! Sophie rode her tricycle around (that means I pushed it) and Leah was in her braught braught (her little car that Charity pushed). We went house to house, got some candy and really just had a great night with our friends laughing, eating food and just hanging out. I dressed up as Jesus; which brought quite the few comments. I was very interested in the amount of people who took note of me being Jesus. One guy said something to the effect of: "Hey Jesus, I got a lot to talk to you about." Being a pastor I kindly replied: "Let me know when you're ready, I have time for you." It may have been a quick comment but hopefully I was able to remind him that Jesus always has time for us. All in all I had a great halloween with my family. 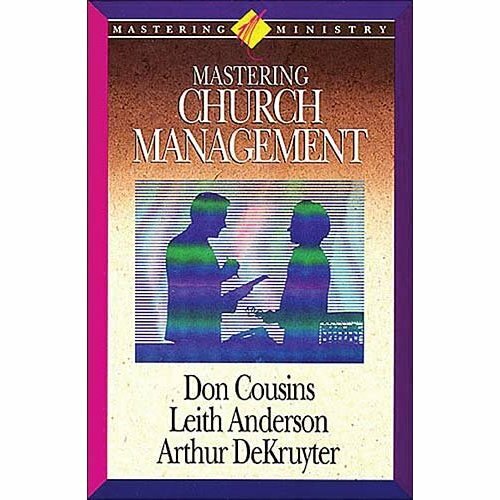 "More is Caught Than Taught Ministry"
This line was shared with me early when I got into ministry: "More is Caught Than Taught". For the last couple years I have thought about how true this statement is. I have invested the last eight and a half years of my life into spreading the Gospel; mainly to students. Over these years I have seen hundreds of students come and go through the doors of our church. As I think back to my internship and the hundreds of students at Eastlake Church that we ministered to there is only one student I keep in contact with. After Eastlake Church I helped out with a church plant just north is a cool city called Encinitas. I have to say that I have loosely kept in contact with one family from that church. Being at South Hills Church for the last, almost, seven years I have had a chance to share the truth of the Bible with lots of people. I think about these last seven years and I have a hard time believing that any of them can remember more than ten messages that I have shared. Ok, lets be honest, I think we would be hard pressed to find someone who remembers more than five of the messages I have preached here. To be honest, I would be stoked if there were a handful of people that remember one of the messages I have preached at our church. If there are a few people that remember one of the messages that I have preached and have acted on that truth of God I would be very excited. 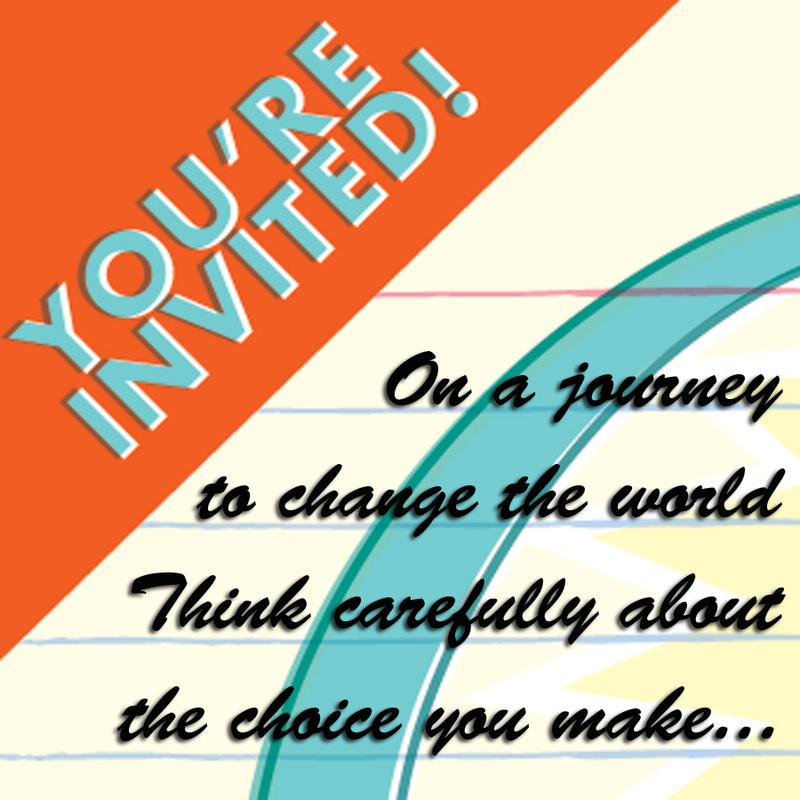 I would more excited to hear about students who have changed the direction of their life because we have spent time with them. I really do think that preaching on Sunday is super important but I think that people are more prone to remember the things we do off the stage. See I think that if you spoke with some of the students in our church they would share that they learned more from me on a road trip to snowboard or out on the lake. 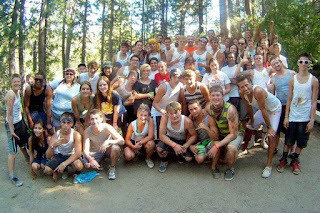 They could probably tell you how I acted at Hume Lake when we played paintball or a conversation we had at the lunch table. I guess what I am trying to say is our lives are an example for Christ and people are watching our every move. I want to be known for how I lived my life off stage. I want people to remember how I acted in tough situations because I chose the high road. "If you successfully complete the above courses as scheduled, you will finish the requirements for the Masters of Divinity program as listed above." I have spent a good deal of time away from my family over the last five years, six when I finish, and this letter means that I can have more time with my family after graduation. Many of you know that I dropped out of high school my junior year. I ended up going back and finishing at a continuation school. I didn't drop out because I was stupid I dropped out because I had a bunch going on in my family life and I was bored at school. Studying the Bible is something that I love to do! I started this MDiv program because felt that God was calling me to but during the process He taught me that it is more about the education I have received than a piece of paper that will sit on my wall. These are just a few things this letter means to my life. It will always be a reminded to me of all the hard work I put in, studying the word of God, to help others know Christ. 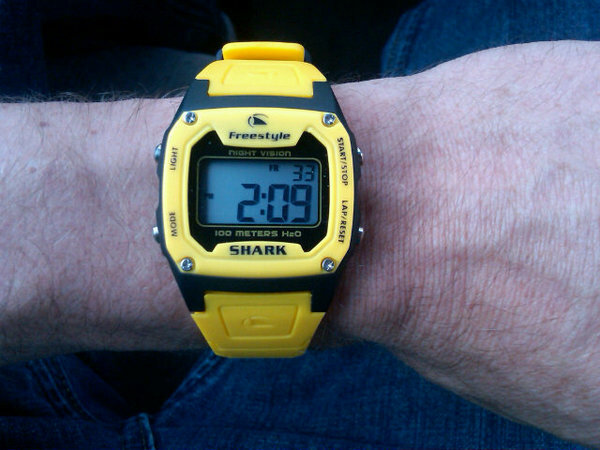 Even since I was a wee little kid I have always wanted a Shark watch. I know... some people want a Rolex but I want a watch with a rubber wristband. So for my 30th birthday my amazing wife found me a Shark watch in my favorite color (see picture). This is me wearing my watch the first day I got it as we are heading to watch a movie for my birthday. This summer we went to Hume Lake and I was so stoked to wear my watch and actually have the time on my wrist! On Tuesday some of the Senior guys invited me to go kayaking with them. Once we were on the lake I realized that none of them have ever been to Hume before and told them that we have to head down to the cove to play on the log roll. We rowed to the other side of the lake, parked the boats and swam over to the log roll. Now the log roll is an amazing experience that I could not let these guys miss out on. After playing for a while I knew it was getting late so I looked at my wrist but my watch was gone. I was so bummed. I was beyond bummed. My watch spent the night at the bottom of Hume Lake but today it sits back on my left wrist as I type this. The craziest thing about this is something that wasn't caught on video. Before I jumped into the lake I stopped to pray that God would help me find my watch and sure enough I did! 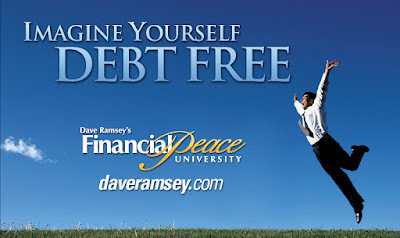 This Sunday we had our sixth week of Financial Peace University. This class has been pretty cool, for me personally, and seems to be very helpful for our church also. My last post on FPU was a brief overview of what we are learning and was just a scratch of the surface. Yesterday I was extremely tired during the class but I was also excited to hear what Dave Ramsey was saying. See I finally felt like yesterday was something that Charity and I were already doing; the previous five weeks were things that we needed to adjust in our finances and that can be tough to hear and more difficult to actually make happen! Never buying anything you do not understand. Seeking the counsel of your spouse. I feel like Charity and I have done good with our money since being married but we want to do better as we move forward. We are examining every aspect of what we have to make sure that we are using what God has given us to the best of our ability. One of the steps in the class is for the people involved to anonymously write down their debt load. To be honest I had no what to expect to see with this number when it came in. Now we have three different sessions of the class that we are offering to our church and from those different sessions we came up with one debt load number. 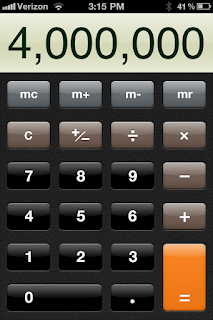 I am not going to share that exact number but I want to let you know that it is over four million dollars. I have been hesitant to put up that number because I think it can bring up emotions in peoples lives and to be honest I have a part of that number. In yesterdays blog I shared my personal learnings and personal debt load that Charity and I are carrying. The reason I chose to end up sharing that number is because I am excited to share with you in December the new number. See FPU is designed to help people get back on their feet financially and take control of their finances. If you are in our church and you are reading this I want you to know that I am praying for everyone in our church to find financial freedom. I am praying for people to be able to take control of their finances and not let their finances take control of them. I am praying for people to find new connections with people in our church that they may have never met because of this course. I love my church and I am so proud of everyone taking the course and making the steps to get financial freedom! This week we hit week five in our Financial Peace University (FPU) Course that our church has been doing. I am one of 260 people in our church that is taking the course in one of the three different times we are offering it. 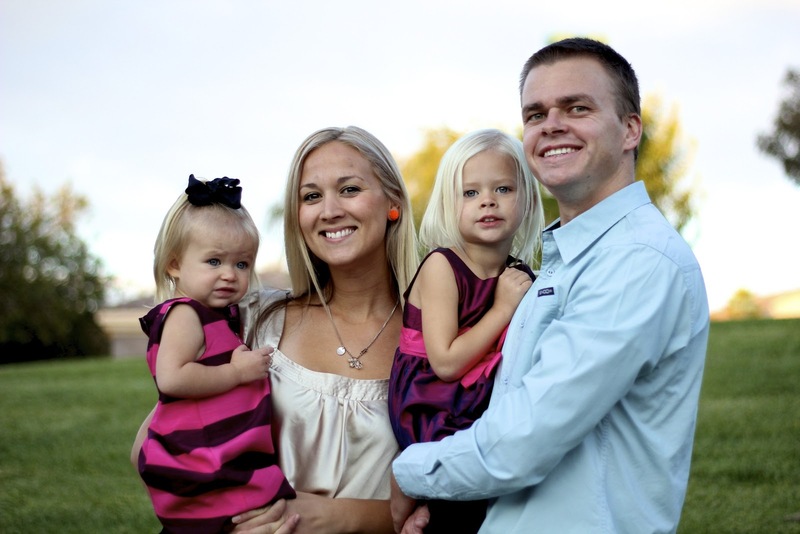 Last night I started thinking about FPU and what this has done for our family already. Charity and I moved about two months ago and well... to be honest, moving cost us more than we had bargained for. We didn't have to rent a moving truck (thanks to a friend) and we didn't have to pay movers (thanks to many friends). When we were planning the move we knew we would need some more furniture to help fill the new house; we went from 1050 square feet to over 1700 square feet. Secondly we have used our credit card like a debt card for the last five years. We would put all our family expenses on the card and then pay it off monthly. Well with the addition of two children in the last three years expenses have increased and we found out that we owed our credit card $1500. 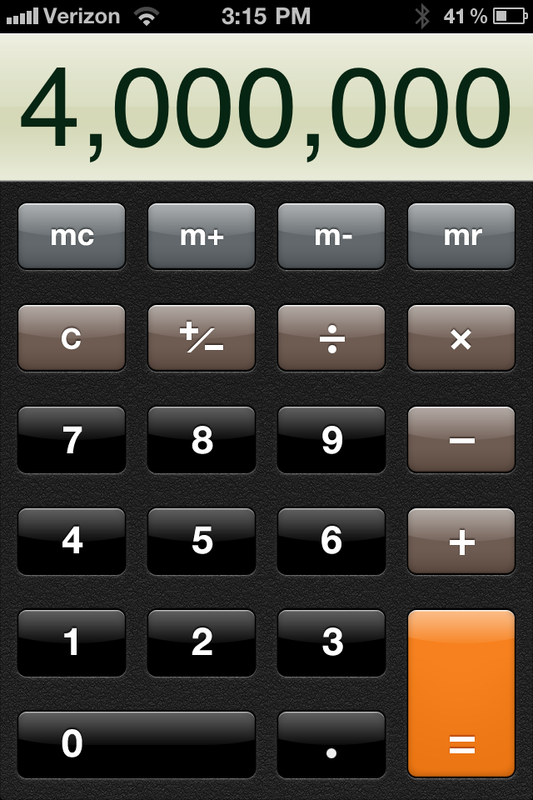 That may not be too huge a number for the average American family but we don't want to be the average American family. Finally FPU has been great to share with the young adults at our church. Charity really took this as her personal goal this summer to get as many college students in this course to help them make wise choices financially right away in life. I love getting to spend time with the people at our table, on a weekly basis, and see how they are getting this lesson before they make the unwise choices. These are some random thoughts from FPU at our church but I really think this course has changed the way I am thinking about money. I want to make sure that I make the best choices with the resources that God has put in my possession. The other day I was looking at my wall and noticed something super cool. See when I arrived at South Hills almost seven years ago I made an agreement to work on my ordination as a pastor. Within four months I had accomplished my licensing with the Christian and Missionary Alliance. From there it was supposed to be a two year process to get my Ordination completed. After two (and a half) years of working on my Ordination I finally took the flight to Sacramento to have my final Ordination interview. The interview could cover over 280 questions and it was all oral. I sat in a room with five men who most had been pastoring longer than I had been alive. I would be lying if I said I wasn't nervous sitting in that room with those men but I also had a confidence sitting there with them. I knew that these men wanted me to succeed; they had been rooting for me the last couple years and now it was time to culminate all my work. After a two hour interview I was asked to leave the room and allow the men deliberate from our time. I was called back in about 15 minutes later. The leader of the interview said some great things about our time together, complimented me on my understanding of Theology and there was a cool sense in the room that day. There is one line that sticks out to me from that time when Doug (our district supervisior) said this: "Neal it is the recommendation of this board to approve your ordination with no reservation and nothing further to work on." I'm not sure if you have ever had anyone say that to you but I was told later that basically I nailed it. My life was in line, I was correct on scripture and that interview affirmed my calling into life-long pastoral ministry. Now I don't share all of this to brag but to just share my excitement of call on my life from where I started my life to where God has brought me. Tonight was an amazing night at Hume Lake... amazing may not be the best word to describe what happened tonight so let me share the story with you. 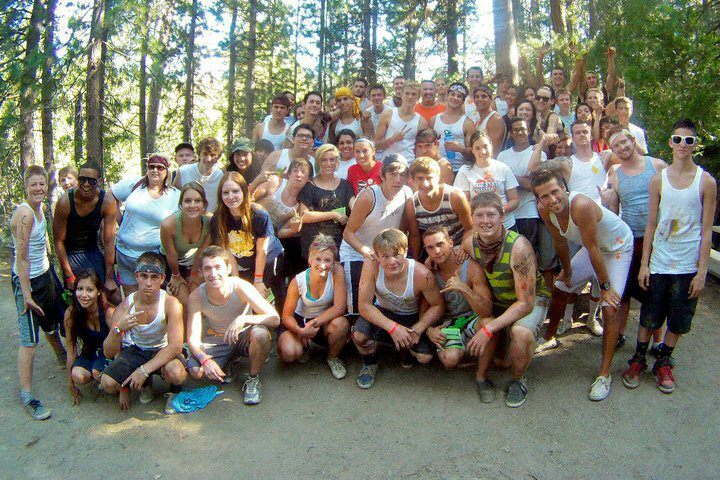 I love that Hume Lake is all about students growing in their relationship with Christ. Part of growing means starting a relationship with Christ and that is exactly what tonight was all about. Chapel started around 7pm and the worship set was really good. After worship I just felt the need to head outside so I can pray for some students. I listened in the pastors message while I prayed for some of the students in our group. That lead to praying for some of the leaders in our group who would be talking with these students later. See when I was praying I was expecting God to work in these students lives. After the message I headed back into Chapel and the pastor had already asked students who made a choice for Christ to stand up. I looked over to my right and saw a handful of students who were standing up. In that group was a young, 16 year-old, who is in my cabin. I have been praying for him for the last couple weeks and I was so excited to see that he had stood up! For the next thirty minutes I was able to talk with this young man, cry with him and just listen. I am so proud of him and the choice that he made tonight. It was great to listen to his story and just hear how he was reluctant to come to Hume. It was great to hear him say how he was fighting with his mom for sending him up here this week and then to hear him say how thankful he is for his mom sending him. Now that part is the best part of the story but it gets better. When this young man left chapel there was a group of about forty students waiting for him when he left chapel. When he opened the doors they cheered for him, hugged him and encouraged him. They didn't do this for just this one young man but for the other six students who stayed back tonight to make a decision for Christ. I love seeing High School students being the church! I can't tell you how many times I heard that when I was growing up. I was a rowdy kid when I was growing up and being the fact that I am a boy that can add to the ruckus. Little boys like to push other kids. We get upset and we don't know how to control our emotions so we do the only natural thing: we push. Then when we push an adult typically approaches us and reprimands us for our actions. We get upset because we are emotional and now we have been caught acting naughty and that can embarrass us. With all that said we are raised in a society that tells us that pushing is bad. I want to say that we need to push people more often. I think we live in a culture that has a tendency to become spiritually lazy. When we become spiritually lazy we fail to take the time that we need to so we can grow in our relationship with God. One thing that I have been committed to in life is to push people to grow spiritually. I want to see adults and students grow into their full potential. Two weeks ago I pushed one of our students leaders out of her comfort zone. We were hosting our mid-week service together and I was the one who was supposed to pray for our Compassion offering. When it came time to pray I passed it off to Chandler to let her pray. My throat was kind of hurting but more than that I knew that Chandler was ready to be pushed for more. I knew that I would get one of two responses from Chandler. See one thing I try to assess when I'm going to push someone is how will they handle this push? Will this push be something that helps them to grow in their walk with Christ or will this push be something that upsets them? To be honest I get it wrong every now and then and I hurt people's feelings but that night I was right. I knew it was a good call to ask Chandler to pray on stage because I knew off stage she would say no. I know it can be a risky call and I was totally putting her on the spot but I just knew in my heart that it was the right call. After that night I sent Chandler a text thanking her for praying and this is the text I got back from Chandler. Are you pushing people in your circle of influence to grow in their walk with Christ? Have you placed people in your life that will push you to grow to be a better Christian? This may be a new thing to you but I took a swimming class in junior college. I could already swim but I needed two P. E. credits and swimming fit my schedule. I got in the pool that first day and almost died. I'm not sure I even owned a pair of swim goggles. Over time I listened to the teacher. I improved on my stroke. I learned a few more strokes and at the end of the semester I swam a mile. Yep, the final exam was to swim a mile and I'm pretty sure I ended up doing it in just under forty-five minutes. Well as I have grown older and I used to swim quite frequently for my cardio workout but that had diminished over the years. Just recently (like last week) Charity had bought some goggles at Costco so I figured I would take a swim at the gym. I did my normal workout and then headed to the pool. When I got done with my first two laps I realized that I am out of shape. After swimming six laps I was standing in the water, straining to get my breath and it hit me: "This is what is like when we fail to grow spiritually." Many of us have had great times in our live that we have grown spiritually and we have seen growth in our lives. God has found favor in our lives and has used us to do some amazing things for His glory. Then, for whatever reason it may be, we stop growing spiritually. We get married, have children, or just decide that is not something we are going to focus on in our lives anymore. Something happens in our lives and we want to be back at that place we were in live. We realize how desperate we are for the relationship with The Lord that we once had and we jump back in and try to pick up where we left off. The sad thing is we are out of shape; spiritually. We are spiritually out of shape and cannot maintain what we once we able to do... and that becomes hard for many of us. This is a reminder for me that I have been out of shape for swimming and that will take time to get back to where I was but I was also convicted that I have gotten spiritually out of shape and need to spend more time listening to the voice of God in my life.